Today’s Bryant Park is bordered by Fifth and Sixth avenues and 40th and 42nd streets. According to a citation in the property records of the New York City Department of Parks & Recreation, this plot was used as a potter’s field from 1823 until 1840, “when the easterly area was taken” for construction of the reservoir. 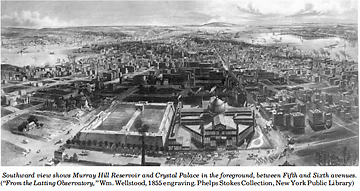 The remainder, named Reservoir Square, officially became a public park in 1847. It was renamed in 1884 in honor of poet and New York Evening Post editor William Cullen Bryant. Fifty-six years later, a resolution passed by the Board of Aldermen on December 22, 1896, declared the [the] reservoir as a public park.” This seems to be the moment that Bryant Park came to occupy the full site between Fifth and Sixth Avenues, obviously prompted by the coming demolition of the reservoir (c.1898-1900). In two December 1897 resolutions, the city’s Board of Estimate and Apportionment authorized removal of the reservoir and erection of the New York Public Library in its place. Parks Department records note “Only building granted for public library; no land assigned.” Thus, while the reservoir stood adjacent to Bryant Park, today’s great library building stands within it. The exposed stone wall visible at the lowest level of the New York Public Library South Court—the auditorium level—is not a remnant of the reservoir as is sometimes thought, according to a 2003 conversation with Ernest Batchelor, an architect at Davis, Brody & Assocs., the firm that carried out the South Court project. There is a visible remnant, but it is not in a part of the library the public can reach. New Year’s Resolution: Rid the Trail of Invasives!